QUEENSLAND'S Islamic community has likened Pauline Hanson to Al Qaeda, saying she is also preaching an ideology of hatred. In her maiden speech to the Senate yesterday, the One Nation leader called for an end to Muslim immigration. The Islamic Council of Queensland's spokesman Ali Kadri has called on Australia's political leaders to condemn her comments. "When somebody can stand up in the Senate and say things which are not only wrong but illegal, in the sense that she's preaching for something which is against our constitution, we have a serious issue because people will see this as a ticket to be openly racist and express opinions which are not only incorrect but immoral." Mr Kadri warned that Senator Hanson's comments could deepen divisions and lead to violence. "Most of the Muslims here are sick of violence, I don't think Muslims will retaliate in a violent manner, but Muslims are afraid and especially Muslim women are afraid to go out, especially when Pauline comes out and says she wants to ban the burka," he said. "I mean we've already seen the rise of right-wing hate crimes in Europe and in America. "One of the parallels I can draw to her is Al Qaeda as a terrorist organisation. I was thinking of taking it easy on community work, than Pauline Hanson gave her speech. Can't let bigotry and racism be only voice, can we? "Before it became a terrorist organisation, it preached an ideology of hatred, and they became the main narrative, and unfortunately Pauline Hanson and people like Donald Trump and others are taking the West towards that path as well, and that path only leads towards the destruction of nations and people and we've seen that in the Middle East. "And if Pauline keeps on spreading her bigoted views and they go unchallenged, I think we have a serious problem. "But I think what will define the future of our country is not Pauline Hanson, it's what the rest of us do." More than 20 years after she first warned of an Asian invasion Pauline Hanson stood in the Federal Senate and riled against Islamic migration, foreign ownership and the rise of the welfare state. "When I cast my mind back to my last day on the floor of the House of Representatives, in 1998… I called out across the chamber: I will be back," Ms Hanson said. "Those around me shouted 'No you won't'." Of course today Hanson proved them wrong and she pointed to electoral boundary changes - which she says robbed her of her seat - and time spent in jail, as evidence of the hard road back to Canberra. "I'm back but I'm not alone. I can not express the pride and honour I have in being joined in this place by three of my colleagues," Hanson said. "As a strong united team I guarantee we will make a difference." 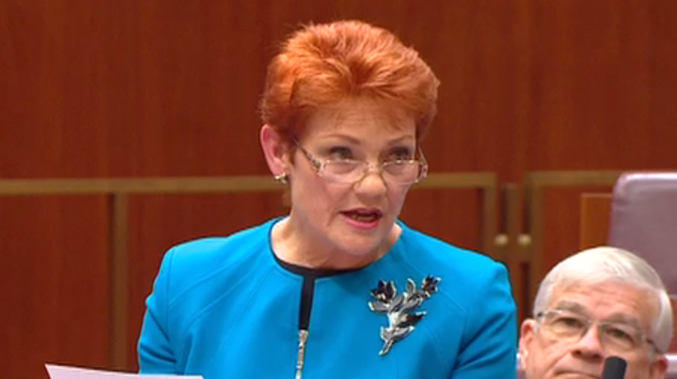 The 62-year-old One Nation Senator then made reference to her first speech where she warned Australia was about to be swamped by a wave of Asian migrants. "Now we are in danger of being swamped by Muslims who bear a culture and ideology that is incompatible with our own," she said. "I love my country, our pride and patriotism and our way of life. 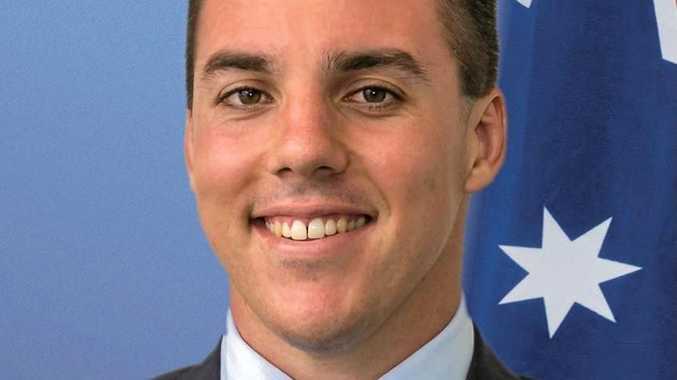 "It's about belonging, respect and commitment to fight for Australia and this will never be given up for the rhetoric of diversity and tolerance." Hanson then described what she sees as a failed experiment in Islamic immigration, claiming Muslims were over-represented in Australian jails, suburbs with large Muslim populations suffer from a lack of social cohesion and Sharia law was likely to be introduced. "Many more Australian Muslims have tried to volunteer for ISIS than we have in our own defence force," she said. "If we don't make changes now there will be no hope in the future, have no doubt that we will be living under Sharia law as second class citizens with second class rights if we continue with the attitude of 'She'll be right mate'." The One Nation Senator then turned her sights on foreign ownership. "Why are we allowing the Chinese Government - an oppressive foreign regime - to own our assets?" she asked. "I want Australian land and houses to remain Australian owned and believe I speak for the majority of Australians." She then called for register detailing all foreign owned assets not merely agriculture. Next Hanson said the Australian welfare state was out of control and urged the introduction of an ID card system with photo and fingerprint identification installed. "I won't accept people complaining about people's privacy," she said in reference to the ID card idea. "If we are ever going to stop the deficit we are going to have to stop the thieves." The final policy reform Hanson urged was family law court reform and she urged Australians to settle divorces outside of the courts and said men and women needed to be treated equally before the judiciary. Hanson ended by thanking her supporters - which included James Ashby, Peter Slipper's former staffer and Alan Jones, for helping to get her out of jail. Hanson received a standing ovation from some of the people on the Senate floor after she finished. Early on in her speech a number of Greens Senators vacated the chamber.